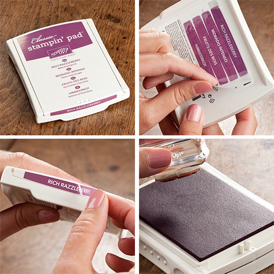 • The firm foam releases more ink (so tap lightly)! • They give an even coverage, even on solid images (so no more linen marks)! • The pad is firm all the way across, so it won’t bow with use. You should also know that 5 colours have undergone formula changes to improve their stability with the new pads. These colours are: Basic Black, Basic Gray, Marina Mist, Perfect Plum, Tempting Turquoise Stampin’ Up! does not recommend that you use the old re-inkers of these five colours with the new ink pads. If you have any concerns, just let me know!